Should Stolen Electronics Be Bricked? Sunday’s This Week in Tech (TWiT) show with Leo Laporte touched on an interesting discussion topic. Leo said he recently left his Amazon Kindle on an airline and someone picked it up. As with all electronics these days, somewhere on the item is a serial number. 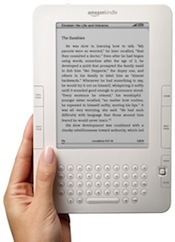 Because the Kindle needs to be registered through Amazon to work, the serial number is therefore needed when you subscribe to the service. Leo brought up the point that anyone who steals one of these devices can easily have it reactivated (Leo obviously deactivated it immediately) and continue on their way. Just like the iPhone, Apple doesn’t ask questions when you activate an already existing unit. However, when you register it, the manufacturer does know the name and address of the person using it, which is required for billing purposes. So, great… someone out there is now using YOUR Kindle and you have no way of knowing who it is. But Amazon knows who is using it. Good luck making them tell you without a subpoena though. One of the downsides to the policies companies have in place is they don’t ask enough questions when another party attempts to use a previously activated device. The discussion on TWiT turned to the suggestion that these units should be bricked — making them unusable. Some cell phone companies do it, so why not everyone? Companies should keep track when a user deactivates their device and make a note on the account saying if it was stolen/sold etc. If it was stolen, simply make the device inoperable. If you sell it to someone else, then have the manufacturer note it was sold and make it available to be reactivated again. Sirius Satellite Radio in Canada uses this method and it has worked out great for subscribers who have their vehicles broken into and their radios swiped. It’s time for everybody to get on board to protect the consumer. The podcast yesterday was great- a perfect mix of relevant info, news, and humor. I completely agree with having some sort of tracking or brick method for electronics, or even possibly insurance. You can spend thousands a year and lose it in an instant if you keep all your electronics in the same bag. It’s so easy to track, why don’t the companies step up and help you get your stuff back?